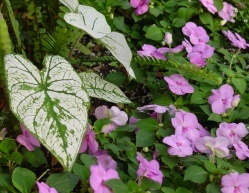 Impatiens provide welcome color in shady spots where little else will bloom. They are reliable bloomers and their brightly fluorescent colors look wonderful grouped with ferns, coleus or caladiums which have similar needs. Soil should be kept moist, but not constantly wet as this will invite rot, mildew and other diseases. Under ideal conditions, impatiens should bloom continuously from spring through autumn until the first frost will kill them off. Standard single flowered impatiens come in a variety of colors from white through pink, lavender to purple, salmon, orange and dark red. The simple individual blossoms consist of five petals and are about one inch across, often with a small darker center which are held nicely above the foliage. Pinching the tops is beneficial as this will encourage the plants to branch out. Double blossomed impatiens, or so called 'double impatiens' produce flowers that resemble miniature roses - also known as 'rosebud impatiens'. They come in the same wide spectrum of colors as regular impatiens and require the same culture. Double impatiens are more suited to container planting and are popular in hanging baskets on porches or shaded patios. There is also a variety named new Guinea impatiens. A near relative of the ordinary impatiens, they have similar bloom - often bi colored. However, the leaves are larger and more elongated. The stems are sturdier and the plant itself resembles more of a shrub. There are also variegated varieties with attractive multiple colored foliage. The new Guinea impatiens can tolerate somewhat more sun but must also be kept well watered. It is possible to start impatiens from seed, but it is a slow and usually not very productive process. It is best to purchase starter plants or flats early in the season. They are readily available in garden centers and plant nurseries and well worth the extra cost. In addition, you can chose the colors you like best and be certain what you are getting. Once your young impatiens are established and have put out some new growth, you can propagate the plants from tip cuttings which readily root in water. All impatiens respond very well to a regular schedule of liquid fertilizer applied about every two weeks or so. You may grow them indoors in pots if there is enough light. Impatiens are tender and juicy - lots of bugs are attracted because of this. Slugs love impatiens and will climb the stems at night to eat up all the leaves. Cutworms also operate at night. They chew off stems at ground level and leave partially eaten foliage. These pests can be a problem when planted directly into the ground. You can eliminate both of these by planting in pots with new potting soil. Other pests include mealybugs, aphids and spider mites which can appear outside as well as indoors.